This house didn't make the cut with Storrer until the Companion. It was originally thought to have been designed by E. Hill Turnock. But it is FLW. 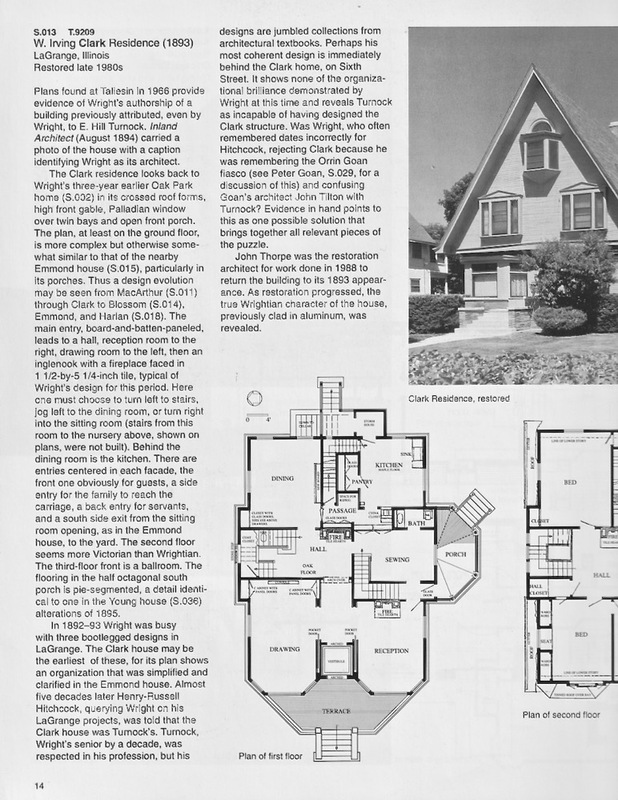 An article about the house appears in Thomas Heinz's Newsletter, chronicling it bona fides. William Morris or not, I still hate wall paper, and would strip it from this house if I had the chance. It may be Wright---but it's all wrong, for me. . . ! Honestly, if we didn't know whose name was on the drawings, would we look twice at this house ? For that matter, would Mr Wright, in his maturity ? I am sure Mr. Wright, who gave the credit to Turnock, would distance himself from this house, as he probably would Furbeck & Furbeck, Goan, Wooley, G. W. Smith, Bagley and a few other 1890s houses. 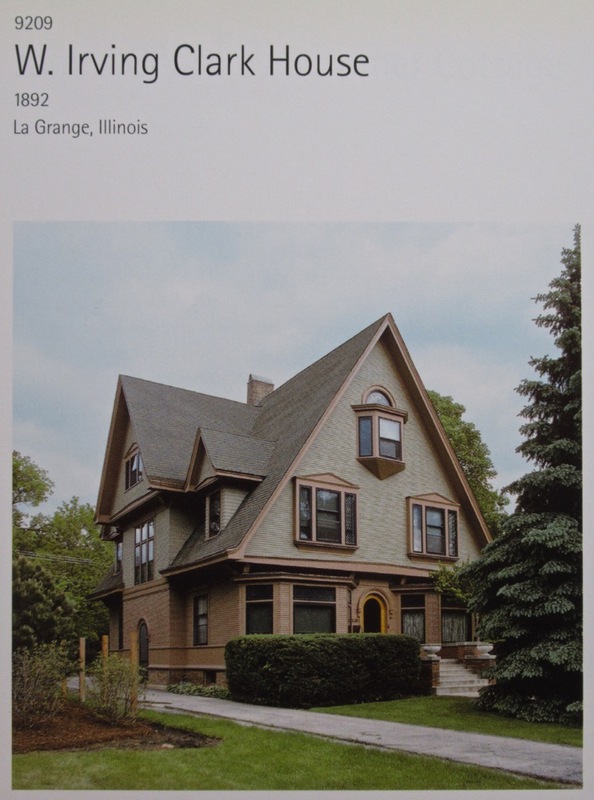 Yet there is a slight relationship between FLW's Oak Park House and Clark in the overall massing, and the plan of the entrance porch emanating from the sides of the flanking bay windows is a detail not seen in architecture of the day. Trifling, true, but it looks like something FLW was using to advance his art, while at the same time dealing with the reality that he wasn't fully in charge of his bootleg career. Another commission that befuddles the senses is the demolished H. W. Bassett Remodeling (1894; S 027). There is less there than at Clark. But one does what one must do under the circumstances. Could they be two different houses ? The second-floor window sets are horizontal rectangles in one view, vertical ones in the other ! As you can see, the real estate photo is distorted, making it look higher and narrower than it is compared to the Taschen photo. Indeed---while in the first photo the house appears wider than in reality. Sort of a cosmic balance has been achieved, between the two photos ? One wonders how these things can happen. Perhaps the photos were resized to fit a preordained space on a page, somewhere ? On my television screen, broadcast material arrives in different formats; while a half-dozen aspect ratios are available on the machine, none of them corrects the image to its proper proportions in some cases. 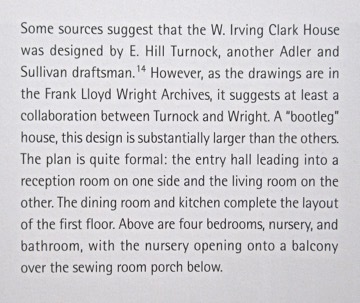 Perhaps Mr. Wright did have something to do with that house design, but I find it hard to believe he had much to do with that convoluted plan. Four separate stairways? A Reception Room and and a same-sized Drawing Room? Thank you. And, in addition to the caption, we have, finally, visual evidence of a noble hand at work ? 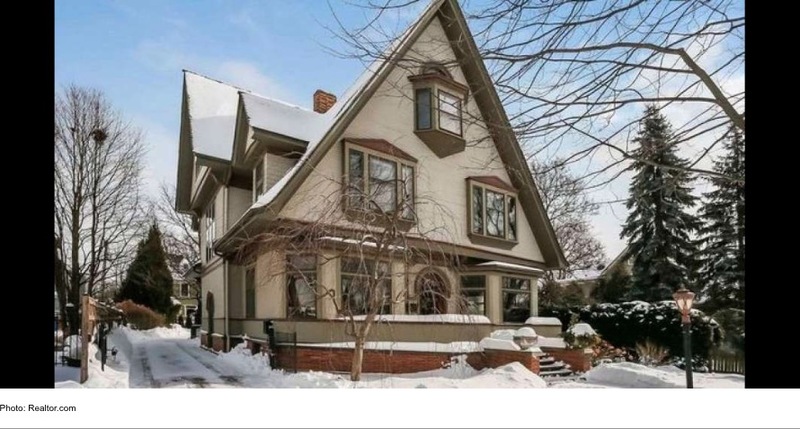 Wright takes the architectural elements of the day and demonstrates their potential; one would think that he was designing for a corner lot . . . ! If you don't like it, blame it on Cecil! Actually, if one looks at this house in comparison with houses by other architects of the era, there is an orderliness and attempt a geometric purity, to the plan, massing, and elevations that seems to go awry when in the hands of others. iteration, all leading to the major gables of the house itself ? As Storrer points out, this was both a residence and a law office, which adequately explains the arrangement of the floor plan with its separate entrance for the commercial enterprise. 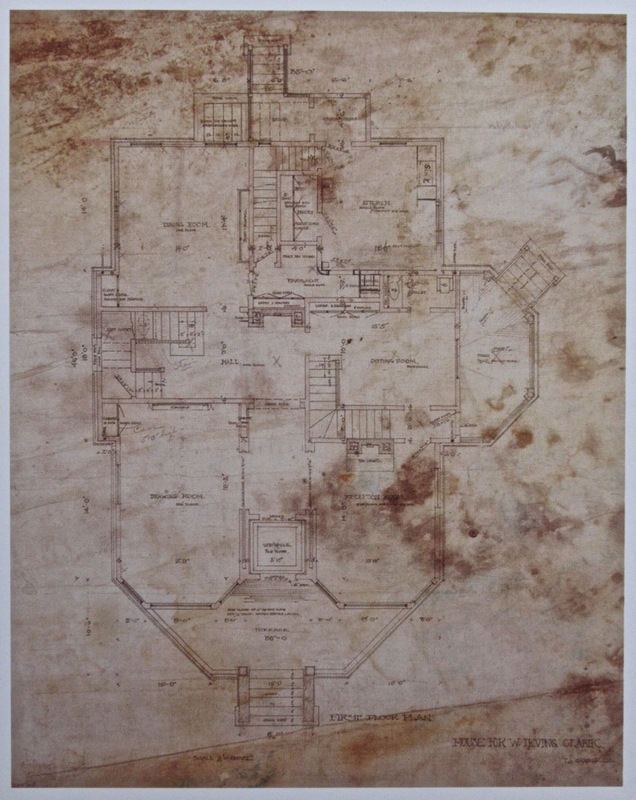 One thing the above floor plan doesn't show is that Mr. Clark's bedroom is above the reception room, while Mrs. Clark is relegated to the much smaller space over the kitchen, where most houses of the age banished the servants. 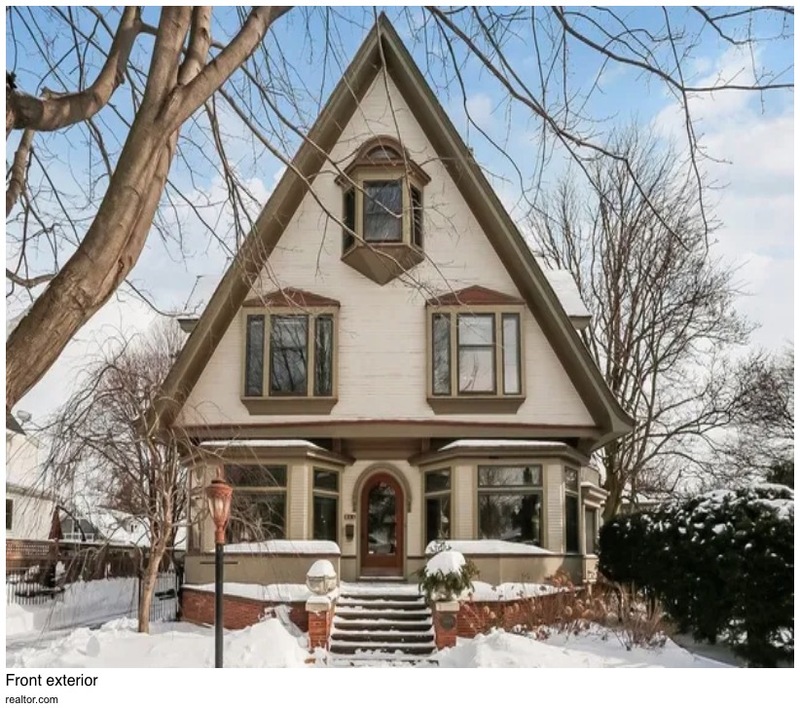 Not being a fan of late 1890s architecture, I don't know if it was a usual thing to design dormers of adequate size topped with a ton of roof. Is that something FLW was looking into, or just the practice of the day?